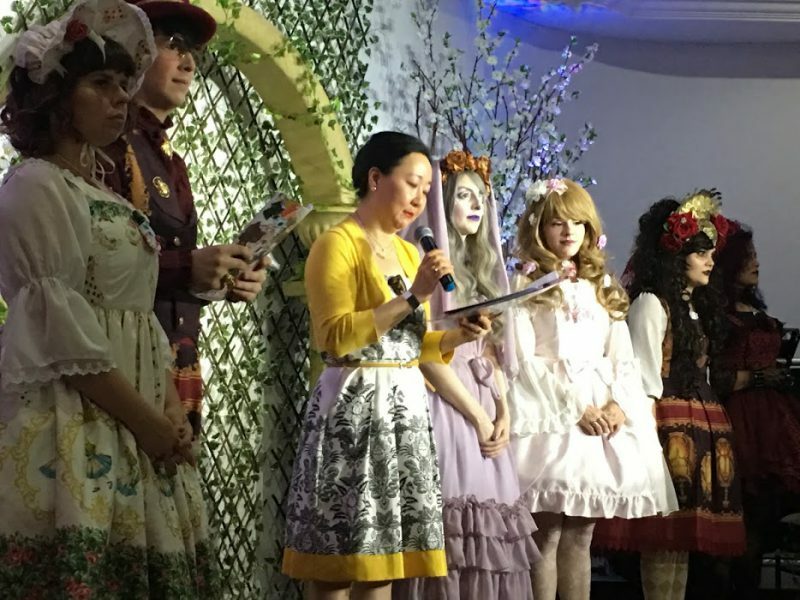 Historical moment: Cristiane A. Sato of the Brazilian J-Fashion Association, flanked by the organizers of the event, presents the Kawaii Pro-Culture Manifesto at the V National Meeting Secret Garden at the Hasbaya Mansion in São Paulo on October 14, 2017. “Beauty is in the eyes of the beholder. Blessed are the people who appreciate innocence, who protect childhood and who practice naivety and loyalty in today’s world. Peace is the privilege of good will people. Pollution, violence, crime, corruption, terrorism, war, prejudice, xenophobia, pain and loneliness. Is this the world we want? For a kinder, more understanding, supportive and prosperous world, where people can afford the ultimate luxury of regaining part of childhood in adulthood, we want to assimilate the Kawaii Culture originated in Japan and to spread it as a tool of global peace. Being a unique cultural manifestation, free of political or religious indoctrinations and not depending on a language to establish communication, Kawaii Culture shows itself as the right instrument to unite different people and generations around the world. We stand in favor of Kawaii Culture in open Manifesto knowing that this is the first time in the world that it happens. Here is Brazil, the furthest place from Japan in the world. But it is here, in the “land of all together and mixed” that there is room for assimilation and socialization. Here hearts separated by oceans, borders and cultures come together to generate something new. We recognize that Kawaii Culture is part of Japanese Culture, that it is integrated into Japanese daily life, and that it is part of Japanese identity for centuries. We see beauty in netsuke, in women wearing kimonos with chidori and usagi designs, in wagashi sweets and in jizõ and inari statues scattered along roads and streets. We were inspired by the work of artists such as Yumeji Takehisa, Junichi Nakahara, Riyoko Ikeda, Yumiko Igarashi, Macoto Takahashi and Eico Hanamura. We understand that suffering was part of Kawaii Culture phenomena, and the importance of the therapeutic effects of kawaii. We only understand the importance of Kawaii Culture in recalling the pain Kewpie dolls’ confiscation for gunpowder production caused in children during World War II, and how the return of the dolls after the war brought relief to young survivors during the difficult reconstruction of Japan. On learning that 222 Himeyuri nurse-girls treasured family shots and illustrations from Shōjo no Tomo magazines inside pencil cases, shortly before committing suicide during the war. In recalling that a child in cancer treatment moved a generation telling that a Hello Kitty doll became her best friend in the hospital for staying days and nights by her side. On finding out that 2011 Earthquake with Tsunami’s survivors and neurological diseases’ patients respond positively to treatment with Paro seal pup robots. Yes, we believe that Kawaii Culture is an expression of art, aesthetics, communication, and of healing of the soul. Kawaii Culture is NOT a fetish or apology to pedophilia. Criminals see malice in everything and everyone. To denigrate or ban Kawaii Culture is to censor art and an act of prejudice. Reducing the space of childhood penalizes socially and culturally good people who should be free. Only the end of impunity and the removal of criminals from society will allow everyone freedom of expression and reduction of prejudice. For these reasons, and so that the work idealized by Takamasa Sakurai will not be forgotten, we release THE KAWAII CULTURE MANIFESTO. We will learn, cultivate, disseminate and defend Kawaii Culture. All true beauty begins with gentleness, understanding, solidarity, and innocence. All peace has this beauty. 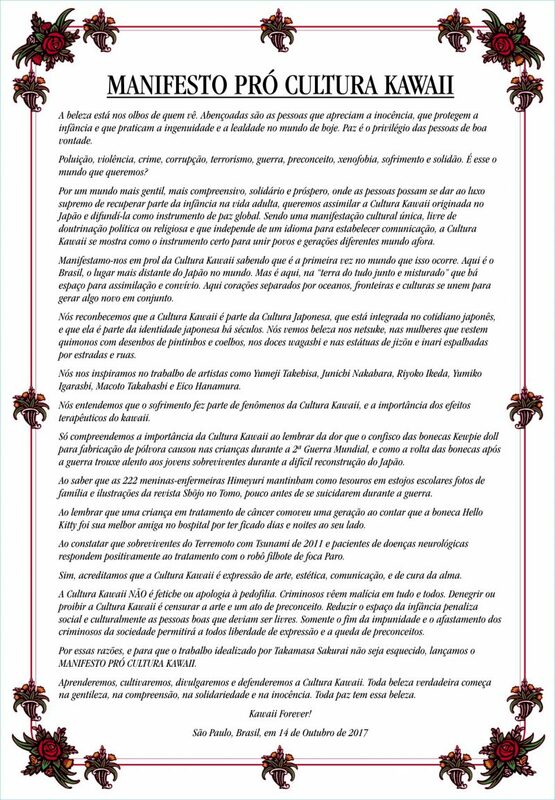 São Paulo, Brazil, on October 14th , 2017.